Mazda is asking owners of some Mazda3 and Mazda5 models to visit their local dealer from October onwards, for a free precautionary technical check of the power steering system. It is part of a Special Service Programme to check for possible residual particles in the power steering pipes which could cause the hydraulic power assistance system and its electric pump to overheat and shutdown. The firm says that in the absence of power assistance the vehicles remain safe to drive as if the electric pump were to shut down, all the mechanical components of the steering system remain fully functioning, allowing the vehicle to be driven safely in the absence of power assistance. In the UK there have been only two reports of a power steering problem on the Mazda5 and none on the Mazda3 - therefore the Special Service Programme for both cars is a precautionary measure. Mazda has not received any reports of an accident or injury associated with this issue. In the UK, Mazda is contacting the owners of 10,268 vehicles who may be affected. Only a few specific models, manufactured between April 2007 and November 2008, could be affected. 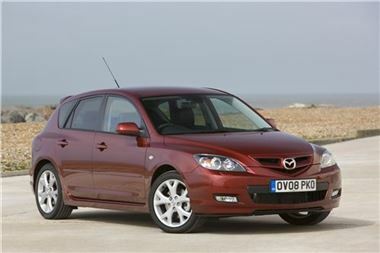 These models are the Mazda3 (1.6 diesel and 2.0 petrol) and Mazda5 (1.8 and 2.0 petrol). Parking and manoeuvring in small spaces will require more steering effort, but driving on the open road will not be affected. If the vehicle suffers a problem with the power assistance for the steering a malfunction warning lamp will be illuminated, alerting the driver. Fixing the electric oil pump and the associated power steering parts will take between 90 and 110 minutes, depending on model, and will be free of charge to the customer.